Okay, so it’s winter. I work in downtown Chicago. It seems like every skyscraper in the downtown area has some variation of the signage above. These signs have always bothered me. Essentially, they are saying, if you choose to walk here, you may get hit in the head by a hunk of ice falling off our ginormous building. Don’t say we didn’t warn you! Is this supposed to be helpful? Is it some attempt at avoiding legal liability for pedestrian injuries or property damage? Do buildings have any liability for damaged sustained from falling ice? 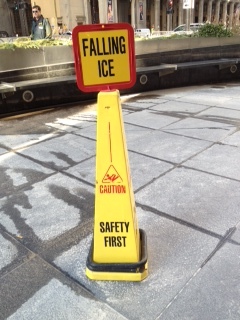 How many building-ice injuries are sustained on a yearly basis? Are these warning signs an indication that one should find another path to a destination? These signs don’t seem to have that effect. People don’t take them seriously. Also, given the fact that every building seems to put these signs on their sidewalks, I think it would be largely impossible to find a clear non-falling-ice path. Maybe walk down the middle of the street and risk getting flattened by a taxi? Then I would have to ignore the “CAUTION: MANIACAL TAXIS” signs.